Latitude 64° is a manufacturer and distributor of discs and disc golf gear. 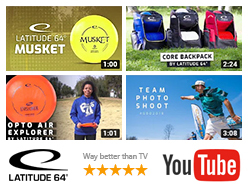 We are offering the best selection of products from Latitude 64°, Dynamic Discs and Westside Discs. We are based in Sweden and are shipping to most parts of the world. We have exclusive distribution deals with companies in United States of America, Finland, Norway and Estonia. WANT TO SELL OUR PRODUCTS IN EUROPE? Are you are interested in becoming a wholesale customer? Please click the link below and fill out the form. WANT TO SELL OUR PRODUCTS IN US? Are you are interested in becoming a wholesale customer in US? Please contact our US distributor Dynamic Discs. Link below.